Have you ever been slightly apprehensive about the hotel room you’re booking? 360 Italy gives you the full picture – every nook and cranny of various example guest rooms in hundreds of Italian hotels. Using the latest digital technology and a special Fisheyes lens, we bring you Virtual Tours of both public and private areas of your hotel. You can zoom in and out, pause, go back and forth. You can even see the Tour in a low resolution format if you don’t have a fast internet connection. 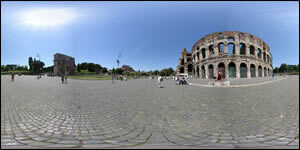 To take a Virtual Tour, simply pick a city in Italy from the choices above and then click on a hotel. If you encounter any problems, it may be that you need to install Java Runtime. To do so, free of charge, click here. Copyright © 2011 Fisheyes Ltd.